Enda Kenny throws a few shapes at Bloom. As Enda Kenny steps down from his long-serving role as Taoiseach, we look back on some of his more awkward moments. The ones that made us spit out our tea in fits of giggles. That moment when you go in for a handshake with one of the most powerful men in the world and you're left hanging. Staring at your own clammy hand, making a point of examining your fingernails but you're really just recalling all those times you were picked last for sports teams in schools. It doesn't matter that you're now [were] the Taoiseach of Ireland, you're still that boy and the cool kid doesn't see your desperate, waving hand. But everyone else saw. Sure doesn't it always happen that way. During a tour of the Bloom Festival at the Phoenix Park, Enda got swept up by the joys of summer and the intoxicating scent of tulips and busted out some of the dance moves he'd locked away in that closet marked 'footloose and fancyfree'. Still, the shackles of dayjob refused to release him from their rusty, metallic grip and he struggled to truly get into it. But he had fun that day. At one point he was flying, but maybe for Enda it was a little too close to the sun. Custom House Dublin: Cruinniú na Cásca, a new national day of culture and creativity. 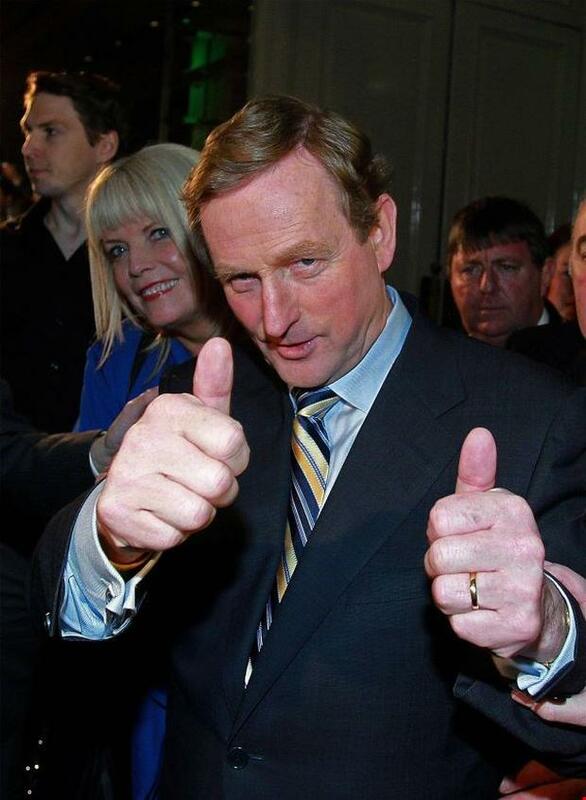 Pic shows An Taoiseach Enda Kenny, T.D. and Minister Heather Humphreys T.D. ,as they enjoyed some of the cultural events taking place in the city. Pic Maxwells Dublin. Relaxed Enda out on the town to have a time of it. All the cool dads are doing smart casual and for a Sunday afternoon of street performances and the odd photo op, he was there to make an out-of-office, sartorial statement. Sports runners, bootcut jeans and a dinner jacket though. Not something you'd see on Becks, is it Enda and he's a cool dad. 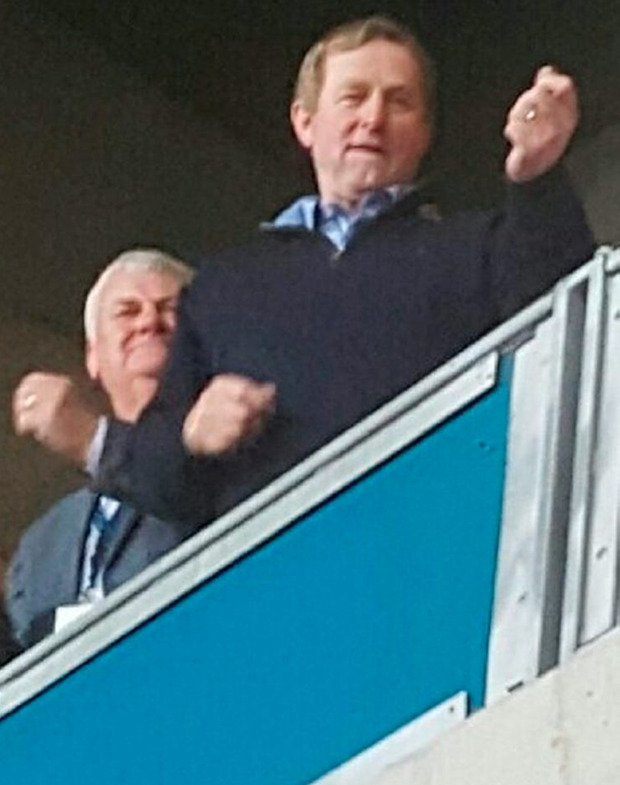 Enda Kenny plays air guitar at the Bruce Springsteen concert at Croke Park. Doing his best Courtney Cox with the added bonus of an air guitar display, Enda truly got lost in music at Bruce Springsteen's Croke park gig. "I am a big believer in Springsteen," he said at the time. "I like his social comment, I like the commitment he puts into his work. I just think he is really a world-class operator. I enjoy his concerts and OK, maybe - I can't sing, I can't dance, I can't play the guitar but I am going to go a long way if I keep following Springsteen." Rock on Enda, rock on. "Paddy likes to know what the story is"
He uttered that infamous line just after the general election in 2014 as he promised his new government would be all about transparency for Paddy (the Irish people). It's like that infuriating feeling when your mam calls to tell you that there's post at home for you and when you ask, with a hint of impatience, who it's from she responds to that tone by saying 'wouwhen someone calls the house phone and your mam picks but but when you ask who was calling, you were told "oh, wouldn't you like to know". Well, yes I would. Stop stating the obvious. Jesus! 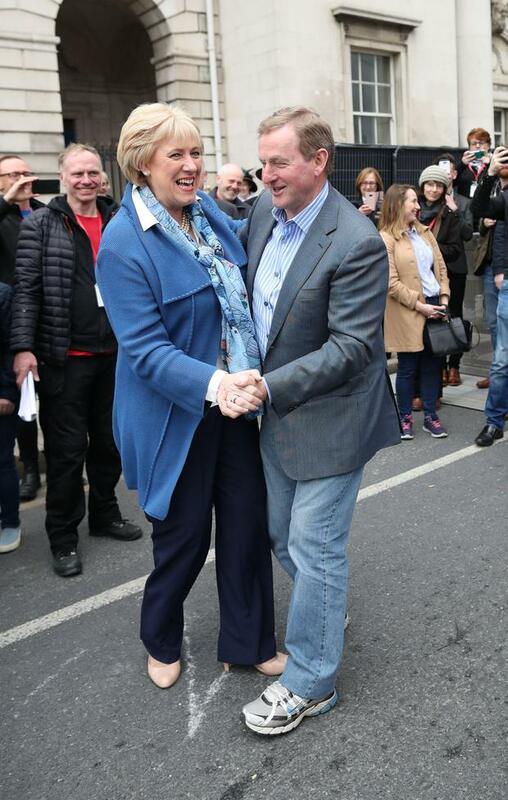 For someone who says he can't dance (see Bruce Springsteen comment), Enda doesn't mind trying. This Easter display of Enda moves is the peak of a sugar rush brought on by a breakfast filled with Cadbury Mini Eggs.